My Nephews Baby Boy Alfie Craig was Christened on Sunday so i had to set to and get a card made. Not my favorite card to make as I always struggle with baby cards but I was quite pleased with the result. Both stamps used were from Papertrey Ink from the stamp set Everyday Blessings. A solitary pearl placed in the centre of the cross to finish. 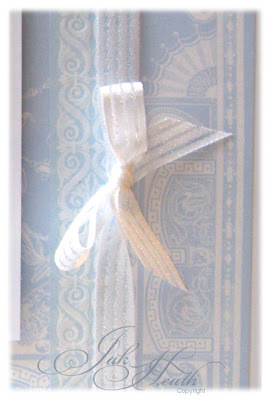 A pretty background paper that I found in my stash was perfect in a baby blues and white, teamed with a pretty ribbon tied in a bow. Beautiful simple card but appears very elegant. wow this is simply stunning Jak love the delicate colours. Perfect. Have a super day. Oh wow what a stunning card. Absolutely beautiful card Jak!Your blog is a pleasure to visit each day. Beautiful Jak, the colors are sooooo delicate.Have a fabulous day. Absolutely stunning card Jak, i love it. Very classic & beautiful; perfect for a Christening!!! You have done it again!!! Gorgeous, simple, lovely colors, elegant and perfect. A Christening is regarded as a very special day and it is good to be able to celebrate the occasion by sending Christening cards. 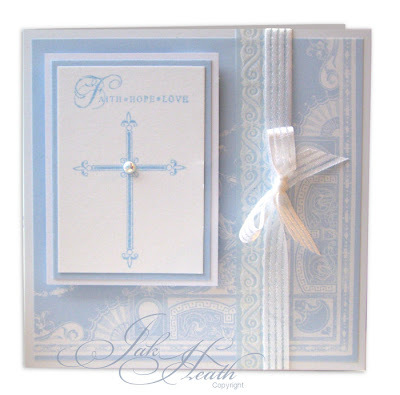 We can send back the Christening card to you, or we can handwrite the card with a personal message for the special occasion of the Christening. We offer the choice of three different handwriting styles for the Christening card and also offer free fun stuffs to add to your the card to make it fitting for that special day. 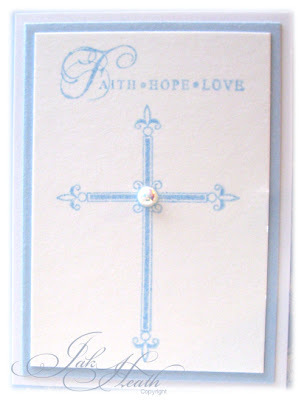 The Card and Gift Company is one of the largest online suppliers of Christening cards. I was really amazed with your designs for christening invitations. It's nice to know that these cards can be more personalized to make it stunning.